There are many different things that can cause allergies - dogs, cats, wheat - even bees! Can you think of any other items that might cause you to have an allergy? Hidden in this wordsearch are a few different allergy causing items - how many can you find? 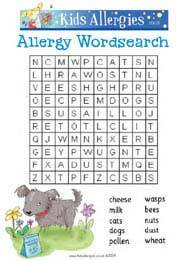 Why not Download the Allergy Wordsearch For Kids and see if you find all the hidden answers. This activity is aimed at 4 to 7 year olds, it's a fun way to raise your child's awareness of allergies and can be used as a fun way to help children with their reading and literacy skills.